Thank you a lot guys!! After 24h, we reached top 100! And after 48h, we reached position #37! You are amazing!! Alkimya has been greenlit! Thank you so much for voting, sharing and giving us feedback!! It means a lot to us! You gave us energy to try our best and finish this awesome project! Thank you! In a universe where alchemy can shape reality, Alkimya let you create your own potions and use them to solve puzzles, interact with environment and fight some fearsome creatures, thus become a true master alchemist. 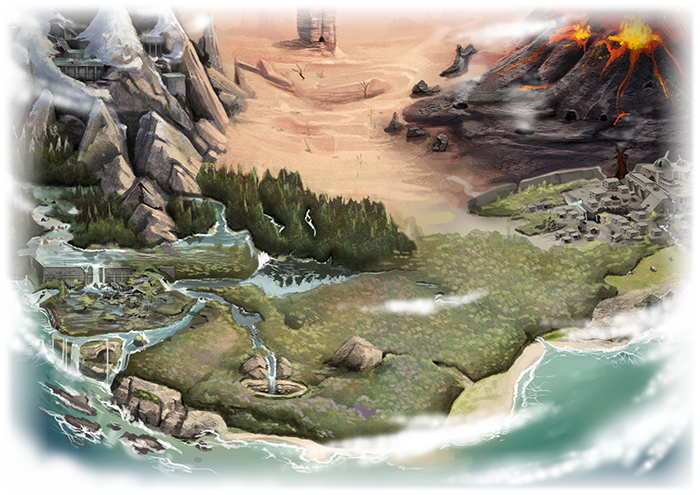 Alkimya takes place in a region that once was the cradle of alchemy, but now is devastated by an old war. The land was abandoned. Test subjects of decades of experiments have escaped and made the region their lair. Seth wakes up in this dangerous area, confused and with no memories, but some alchemy knowledge. He starts his journey to survive and recover his identity, assisted by a mysterious homunculus. - Make your own potion: Combine elements to create new ones! Air + Fire = Lightning. Change the flask to modify the type of the bomb. Transform an explosion into a barrier! Same elements + different bottles = new potions! - Interactive environment: Through alchemy, raise the water level of a lake, cross a river by creating ice platforms, use the wind to move objects, lightning to start an engine. - Real time tactical combat: Each enemy has a unique behavior, a better way to defeat it and elemental resistance and weakness. Choose the potions wisely andplay smart! - Alchemy puzzles: Solve the most challenging puzzles by using potions! They can combine multiple elements and be dynamic, changing over time! - Local co-op mode: A second player can join the main story as a homunculus to help in combat, solve puzzles and collect resources. - Rich and diverse dungeons: Each one has its own theme, terrain and vegetation. Visit a homunculi factory in a volcano and a submerged temple in a swamp! And the most important, you can only progress through them if you improve as an alchemist and use all your knowledge! - Exciting new universe: Alkimya brings a new and fresh fantasy world. A place of science, adventure and mystery. Home of homunculi, chimeras and masters alchemists. - Why the camera is so far? It looks great, will you release it on PS4 as well? Eu dificilmente me empolgo muito com jogos indie, mas esse ai é de cair o queijo. Mal posso esperar o lançamento. Lokoo, provavelmente no segundo trimestre de 2017. O preço não está 100% definido ainda. Mas será o que geralmente indies desse estilo de jogo cobram. WOW GOOD! WHAT GAME-ENGINE DO YOU USE? O jogo será Grátis ou Pago? Alkimya has been Greenlit and is now listed in the Steam store. For the latest information, purchase options, and discussions for Alkimya, please see it on the Steam Store or in the Steam Community.